Christine is a semi-professional singer and entertainer. 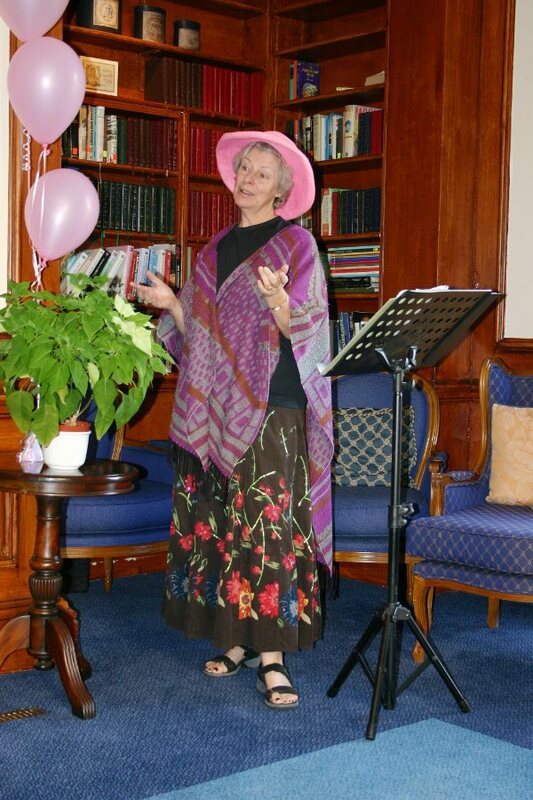 She regularly performs for clubs, societies, retirement homes, day care centres, after-dinner events, WI groups, and for any organisation who would like a programme of songs, poems, readings, humour, and general chit chat. She performs either with a piano accompanist, or a-capella, as the organisation requires. There are no pop songs or amplified music (except that she will bring a PA for a large group where a microphone is required). She can organise more specialist events, for example she is able to provide a lutanist to accompany her at events such as garden parties. She also organises bigger musical events, either performing on her own, or with friends. Her specialities are "The Music Hall" and "Victorial Parlour Songs". She has presented residential courses on these topics at various study centers including Denman College, which is the headquarters of the WI, and also at Urchfont Manor. She presented an evening of Music Hall at the Regency Theatre, Farnborough. She also has lectured on "The Music Hall" (with demonstration) at Walton Hall for the Open University. She is registered on the speakers list of both Surrey and Hampshire Federations of Women's Institutes. To learn more, contact Christine directly, by phone or e-mail. Christine met the famous Welsh tenor, Wynford Evans, many years ago when he was tutoring at the Charterhouse Summer School for Musicians. Later she began taking regular lessons from him, and in 2008 she began organising masterclasses on his behalf. She organised a series of 3 very successful masterclasses, which came to an end with Wynford's very sad death in September 2009. Wynford was a wonderful teacher, not only with the singing voice but also with presentation skills which she thinks are very important and often negected by singers. Christine has decided to carry on organising Masterclasses. See www.singing-masterclass.co.uk. Christine sings with the Carillon Singers, and Campanile, which are mixed voice choirs based in Farnham. She is also a keen supporter of the Hart Male Voice Choir. Christine is a keen gardener, and together with husband Keith, they hold the National Collection of Canna at their home in Farnborough, Hampshire. They also have a garden nursery, which is at Bisley in Surrey, which specialises in cannas. They exhibit at shows such as The Hampton Court Palace Flower Show. They welcome visitors to see their garden and visit their nursery. "Taking a Stand - behind the scenes at Hampton Court"
"Hunting wild cannas in Argentina". "Language, the BIG IDEA that separates us from other animals"
27 Guildford Road West, Farnborough, Hampshire GU14 6PS. The website of Christine Hayward, singer and entertainer. Sales of planters and plant pots. Hart Male Voice Choir. The best club a man can belong to. Plant heritage: National Council for the Conservation of Plants and Gardens. Farnham Humanists. A local atheist group.